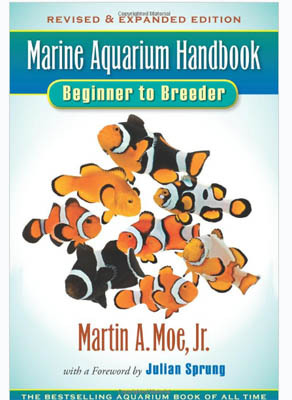 Martin A. Moe’s Marine Aquarium Handbook: Beginner to Breeder was named Best Science Book of 2010, reports CORAL Magazine. Recognized as a founder of the aquarium hobby as we know it, Moe was presented by the Independent Book Publishers Association, with the Ben Franklin Award. This award honors outstanding writing and design in independent publishing. This latest edition of the Marine Aquarium Handbook, is a collaborative effort of Martin, his wife Barbara, and several other CORAL Magazine contributors. The book was edited by James Lawrence, and sports a foreword by Julian Sprung. Each topic is covered in detail with beautiful photography to help illustrate it’s points. So what are you waiting for, get your copy now!